What do you call former Lord Chancellors? 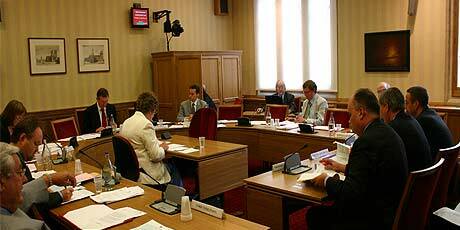 At yesterday’s meeting of the Constitution Committee in the Lords, we took evidence from three former Lord Chancellors – Jack Straw, Lord Mackay of Clashfern and Lord Falconer of Thoroton – as part of our inquiry into judicial appointments. While we were waiting for them to enter the room, I wondered aloud as to the collective noun for former Lord Chancellors. One colleague offered ‘a concordat’. During the meeting, there were some notable disagreements between the witnesses, especially between Jack Straw and Lord Falconer as to the role of Parliament in the process of appointing members of the Supreme Court. (Jack Straw saw a central role for Parliament; Lord Falconer did not.) After they had left, we agreed that the one thing we could not describe them as was a concordat of former Lord Chancellors! We are still wondering what would be an appropriate term…. This entry was posted in Uncategorized and tagged Jack Straw, Lord Chancellors, Lord Falconer of Thoroton, Lord Mackay of Clashfern, Lords Constitution Committee. Bookmark the permalink. 21 Responses to What do you call former Lord Chancellors? Are you even sure as to the term “Lord Chancellors”? Couldn’t it be “Lords Chancellor”? Dean B: No, it’s Lord Chancellors, like Lord Justices. It’s different with the Attorney General. Yeah. Properly, “Chancellor” is the head word, and “Lord” is an adjective; by contrast, “Attorney” is the head word, with “General” being a post-positive adjective. Except for a few things borrowed from French, the head word, whether first or second, is made plural. But some people do use “Lords Chancellor”, and some terms are double pluralised, such as “Lords Commissioners” for various offices held in commission. How wide spread relative to earlier times are these retired officials in public life. Lord Mayorjune, the Lord Spoken, Lord of the Wool Sacked, Garter King Disarmed, Black Rode and in the rare case of titles stripped a “Disapeer” would perhaps all fit into a single revision of the rules and then the work would be done. You might carry the work back to Hull and when the time comes to retire you could be Professed Philip Lord Norton. Frank W. Summers III: Indeed, I am a vibes types of person…. A “woolsack” of Lord Chancellors would be problematic since that term now really belongs to the Lord Speaker (though Lord Falconer and his predecessors would qualify). Maybe a “pouch” of Lord Chancellors (referring to the bag that holds the Gracious Speech)? Just to make it clear, I intended the suggested reforms to each go with the proper office and not all to the direct question about Lord Chancellors. I assume that is not what either of you met. However, in case it was intended I clarify. a ‘backstep’ of Lord Chancellors? There are two here that I especially like, but have yet to decide which is my preference. Perhaps I should try them out on my colleagues…. Perhaps a justification of Lord Chancellors? Or maybe a perseverence of Lord Chancellors. The list continues to expand in impressive fashion…. How about a fleet of Lord Chancellors–something of a meta-reference to the lordships held by each? By the way, count me among those who would be more comfortable with the construction Lords Chancellor–or even Lords Chancellors!